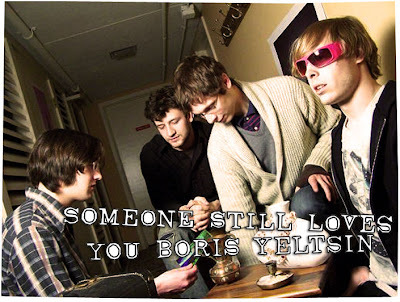 After scrupulously rummaging through my earlier mp3 collections (which you’ll see more of this week), I stumbled upon this particular track which I’ve owned for a while now, ‘Oregon Girl’ by Someone Still Loves You Boris Yeltsin, but which I never came around to fully devoting myself to. The intro to the track is nothing to shout about what more to write about, but as soon as those few catching guitar lines in the chorus kick in, I was literally swooning for more. Someone Still Loves You Boris Yeltsin, (or otherwise more conveniently and less painfully referred to as SSLYBY) is an American Indie band from Missouri that conjures up perfectly polished pop numbers and aren’t afraid to admit so. Before we proceed any further, I feel that a further explanation regarding something of huge significance is called for; the band’s name refers to the first president of Russia - though it’s quite puzzling as to why the band would call themselves ‘Someone Still ...etc etc’ as oppose to just Boris Yeltsin. You agree, no? The pop trinkets which the band crafts out are of the simple and straightforward kinds you may come across with but yet never fails to leave an optimistic, upbeat impression. ‘I am Warm + Powerful’ overruns with a ‘warm + powerful’ discharge while still maintaining its haziness attributable to its lo-fi production. Whereas ‘Pangea’ is immaculate and sweet, drizzled generously with the sounds that could or would come straight out of the late 60’s music scene. Really good stuff, this is.